Posted by Iris Yan on 11/21/2018 1:53:30 PM. Do you know that Amazon has tens of thousands of free Kindle books available on Amazon website? I bet most of you will say “Yes”. Everyone love freebies, and I am not an exception. Therefore, I have collected the following methods about how to get free Kindle books to share with all of you. This method is a universal method and most-used method. You can find all free Kindle books listed at Amazon official site. Step 1. 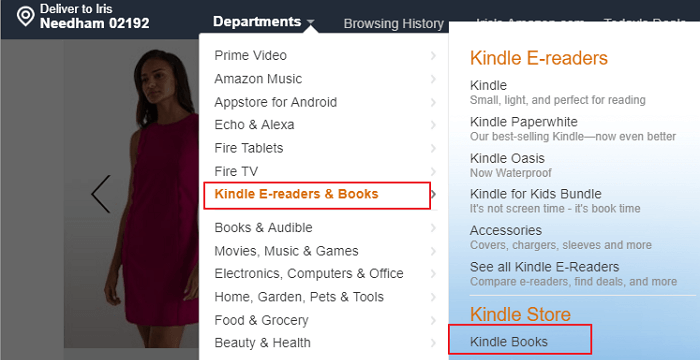 Log in your Amazon account and move mouse to “Department”, and then go to “Kindle E-readers & Books” and click on “Kindle Books” at the drop-down list. Step 2. Now you will go to the Kindle eBooks store. Scroll down your mouse to the bottom of the page and sort the books at price “from low to high”. You will see the Kindle books displayed at the price from 0$ which are total free. Step 3. Select the book you want to read and purchase it as you purchase other eBooks on Amazon, but this time it will not cost you a penny. It is easy to use this method to find free Kindle books on Amazon.com. If you do not want to sort the Kindle books by their prices, here I want to introduce a simple Google search that will show all free Kindle books on Amazon.com. Go to the Google search page and then copy and paste the following phrase“intitle:Kindle site:amazon.com "you save * (100%)" (title of book, author, or category)” to the search box and click on “Google Search” to start the search process. Finally, you will get the free Kindle books listed at the search result. There are some awesome websites that collect the discounted or even free Kindle books every day and display them at their websites. If you have signed up for email alters on these websites, you will get the notification and never missed a deal or any free Kindle books! Here I have listed the top 5 websites that collect free deals of Kindle books everyday for your reference. Editor handpicked discounted & free deals covers more than 20 genres and mainstream eBook retailers. All free Kindle books are updated hourly to ensure you will never miss out any of time-limited offer. A website that scours the internet to find the Kindle books. You will find more than 33000 free Kinde books there. This website updated the free and discounted Kindle books everyday. This website offers you the daily Amazon free books. The most import feature of this website is that it enables you to find the exact types of books you want to read with its filters. If you want to get the updated Amazon free deals, you can sign up these websites and subscribe their daily newsletters. There are also some other websites have the similar service, such as Kindle Buffet, eBookDaily, Freebooksy and so on. You are welcome to read the full list at 60 Sites to Download Free Kindle Books. No matter Kindle Unlimited or Amazon Prime membership, both of them offer you the best opportunity to access Amazon Kindle books for free. Still there are some differences between these two memberships, you can read the article Kindle Unlimited Vs. Prime Reading 2018 to get the detailed information. If someone shares his purchased Kindle books with you, you can get Amazon books without paying. This is a little bit tricky but it is really a workaround to get the Kindle books for free. If you are interested in this tip, you can read 6 Methods to Share Kindle Books with Friends and Family to know the details. More than 11000 libraries in the United States offer public library books for Kindle. If you have your local library card, you can borrow Kindle books from your Local library via Overdrive. For the detailed steps about borrowing Kindle books from library via Overdrive, you can read this article: How to borrow books from library for Kindle Fire . To borrow Kindle books via Overdrive, you should have a library card at hand. Not all of us have the library card, right? In this situation, you can borrow Kindle Books from Booklending.com which enables you borrow and lend Kindle books without going through a library. Step 1. Register and log in Booklending.com. Step 2. Click on “Borrow a book”, fill book title you want to borrow search bar and then click on “Search” button. Step 3. You will go the a new page with the search results. If a book is lendable, you will see orange “Borrow” button at the end of this book. You just need to click on this “Borrow” button and no further action is needed for borrower. What happens next depends on whether or not there is already a loan offer in the system. To be mentioned, the borrowed Kindle books will be returned to the lender automatically if the lending time is over 14 days. Please ensure you have finished this book within 14 days. These are the 6 methods that I want to share with you today about getting Kindle books without paying. If you have any better tricks or tips, you are welcome to leave them in the comments. Note: All Kindle books are protected by DRM sheme which prevent us from backing up Kindle books to our computer. Epubor Ultimate, the best eBook DRM Removal & eBook converter, can not only help you remove the DRM from books purchased from Amazon, Google play, Kobo and Nook, but also convert eBooks to any format as you like. So just download the free trial now!